Mr Akintola Williams was born on August 9, 1919 in Lagos State Nigeria. He was born in a wealthy family with generations working with white settlers in Nigeria and the government. His grandfather was a successful merchant while his father, Mr Thomas Ekundayo Williams was a clerk who worked for the colonial office before starting his legal firm in Lagos. Olowogbowo Methodist Primary School, Bankole street, Apongbon, Lagos Island, Lagos, in the early 1930s; he attended the same primary school which his late junior brother Chief Rotimi Williams attended. During his elementary education, Akintola enjoyed academic success, winning a scholarship to obtain a Diploma in Commerce from Yaba Higher College. Because of the absence of higher education institutions offering Commerce in Nigeria, Akintola Williams travelled to the UK to further his studies in 1944. 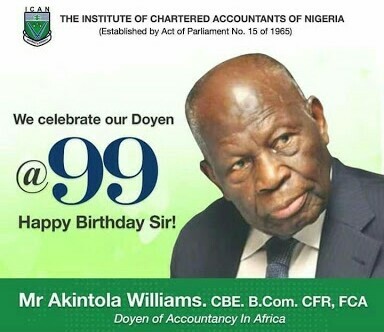 In 1949, he successfully qualified as a Chartered Accountant in London, UK 3 years after obtaining a Bachelor of Commerce from the University of London. With an undying interest in the Nigerian economy and business sector, he returned to Nigeria in the year 1950 and immediately got a job with the Inland Revenue as an assessment officer. In 1952, Mr Williams resigned from the Inland Revenue to set up Akintola & Co to compete against already established business firms in the capital many of which were not locally owned. Between 1964 and 1995, his firm Akintola & Co grew so big that he had over 500 staff, branches all over West Africa and partners worldwide. Akintola Williams retired actively at the age of 64 in 1983 but continued to serve his firm and Nigeria. He was part of the team that established the Nigerian Stock Exchange. He was actively involved in the running of these organisations into his old age. In one of the stock exchange ceremony in May 2011, he called on operators to protect the market and ensure there it is scandal free. Some public sector positions held by Mr Akintola include Chairman of the Federal Income Tax Appeal Commissioners (1958–68), He was also an important member of the Coker Commission of Inquiry into the Statutory Corporations of the old Western Region of Nigeria in (1962), member of the board of Trustees of the Commonwealth Foundation (1966–1975), Chairman of the Lagos State Government Revenue Collection Panel (1973) and Chairman of the Public Service Review Panel to right the wrongs in the Udoji Salary Review Commission (1975). Other positions held that he held include President of the Metropolitan Club in Victoria Island, Lagos, Founder and Council member of the Nigerian Conservation Foundation. He also saw the need for more Chartered accountants in Nigeria, so Akintola Williams set up the Association of Accountants in Nigeria in 1960 and the Institute of Chartered Accountants of Nigeria. He was the first president of the Institute of Chartered Accountants until he retired in 1983. After retiring, Akintola dedicated his time and effort in various projects in the Arts. He built and establish the centre and concert hall for the Music Society of Nigeria. In 1982, the Federal government of Nigeria honoured him with the Order of the Federal Republic award. He was appointed as Commander of the Most Excellent Order of the British Empire in 1997 and the Nigeria-British Association presented him a legacy award in 2011. With much inspiration from his successful merchant grandfather, Akintola Williams saw a gap in the formal business sector in Nigeria and filled it totally. He was Awarded the Commander of the Most Excellent Order of the British Empire (CBE), Sir Akinola Williams will turn 100 in 2019. He was married to his sweetheart, Mrs Efuntiloye Mabel Williams, who later died on Wednesday, July 8, 2009.